Valencia is the third largest city in Spain after Madrid and Barcelona, and is famous for a number of reasons: it is one of the earliest Spanish colonial settlements of the Romans (founded in 138BC), subsequent occupation of the city by Moroccan and Arab Moors has resulted in a beautiful mixture of both Catholic and Muslim influenced architecture and the locals enjoy extended festivals amongst which the ‘Fallas’ are most celebrated (five days of street partying, fireworks and paella). Oh, and Valencia has a football team apparently!? But in my humble opinion what Valencia should really be famous for is its UTTERLY AMAZING Marathon!! As a modern tourist destination Valencia is beautiful, has lots of accommodation and it boasts a good local airport within 20 minutes’ taxi ride of the city centre. The Marathon is run alongside the 10K race and so the whole event attracts 1000s of runners, giving it a bit of a buzz. The race event is well organized and extremely well marshaled. The people of Valencia throng the streets and are very noisy in their support. Lots of bands, DJs and 1000s of supporters keep the runners motivated and enthusiastic. Towards the end of the race the crowds are deafening. The race route is flat: very flat! Consequently, it is very, very fast indeed. The 2017 race was won by Sammy Kitwara of Kenya, in a rather quick time of 2:05:15 which stands as the fastest marathon time in Spain. 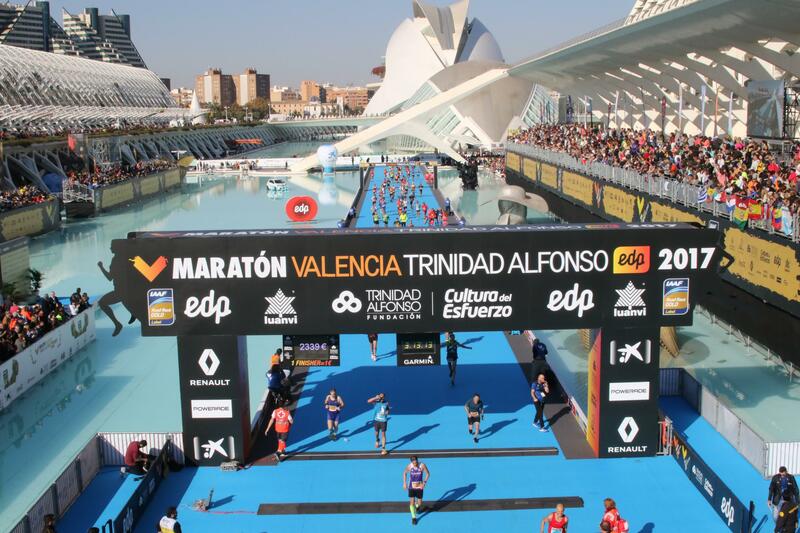 The marathon is hosted in the autumn, which means in Valencia, dry, sunny, mild weather. Despite the sun getting a little warm by midday, the running conditions are lovely compared to the November weather experienced in the UK. There is a massive international field (18,000), with runners from many different countries. However, the runners are overwhelmingly Spanish and incredibly friendly. I was really impressed with the number of runners who wanted to communicate knowing full well that we didn’t speak the same language. Not once did I detect anything but kindness and enthusiasm from the runners or the locals. The start and finish of the marathon are brilliant! The start is a galloping charge across the Montovilet Bridge (one side of the dual carriage way for the marathon, the other side for the 10K race), whilst the finish is a descent down a ramp off the streets, a sprint round the outside of the Museum and Arts Centre to the a final home straight across a bright blue pontoon bridge built over an artificial lagoon(see photo below)! Personally, I thought the event was a wonderful experience. 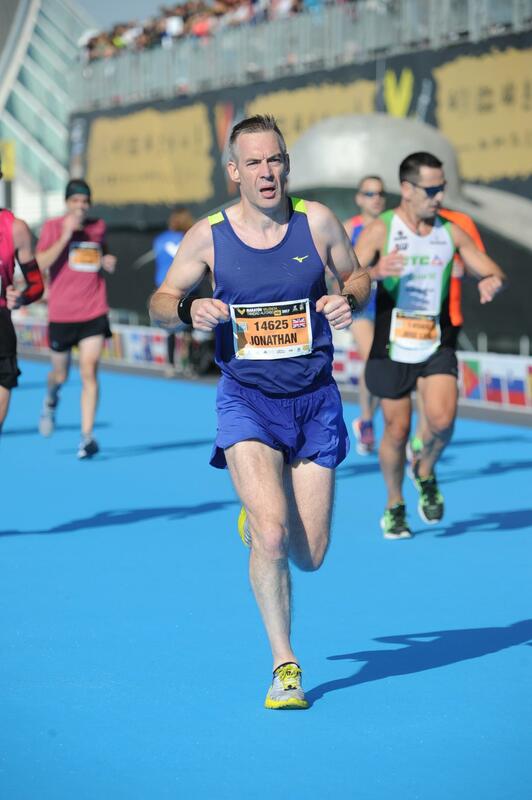 Running a marathon at close to one’s limit is never entirely pleasurable but for me the Valencia Marathon was as close to being enjoyable as it is possible to get! I achieved a PB (and pretty comfortably too) and felt the only limiting factor was perhaps the heat of the sun during the final hour of the race. To get a pretty accurate impression of the whole event I recommend that you should view the Official Race Video which can be found on the Valencia Marathon website.